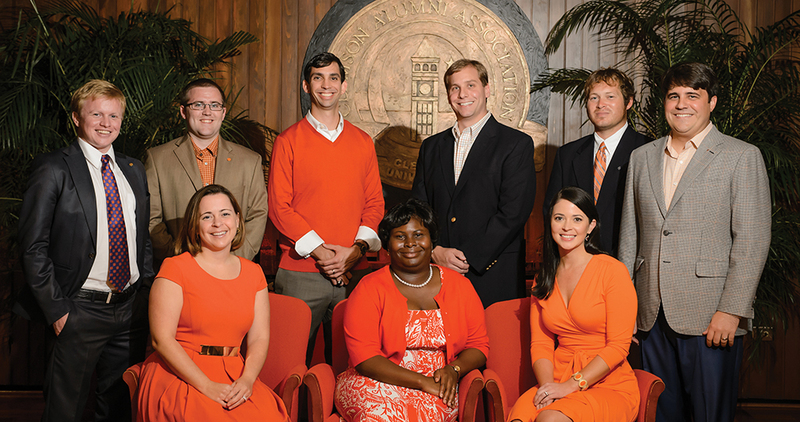 This fall, the Young Alumni recognized ten young alumni who have made an impact in business, leadership, community, educational and/or philanthropic endeavors, while exemplifying Clemson’s core values of honesty, integrity and respect. Meet this year’s Roaring Ten. President of the Nashville Area Clemson Club, Benjamin Thomas Miskelly works with his church as a youth leader, with “Rebuilding Together Nashville” on the board of directors and as a Clemson representative with the ACC/SEC Leadership Council. He is an urban planner and graphic designer with the Metropolitan Nashville Planning Department. Brianna A. Woodsby is a student in Clemson’s MBA program. President of the Spartanburg Clemson Club, she is active in Junior League of Spartanburg and is an IPTAY representative. International trade manager with AFL, she is chair of the advisory board for Wofford’s Kappa Delta chapter and active in Spartanburg Young Professionals and the United Way Young Leaders Society. The youngest human resource director in the history of Milliken & Company and the youngest chair of the Spartanburg County Republican Party, Joseph Nicholas “Nic” Lane serves on the Student Affairs Advisory Board and works closely with the Michelin Career Center, offering advice on how to make students competitive in today’s professional environment. He also is on the board of the Blood Connection. Michael Blake Berry was named 2011 Teacher of the Year at Pendleton High School and selected by the S.C. Association of Agricultural Educators as the Outstanding Young Teacher. He is president of the S.C. Association of Agricultural Educators and president of the historic Pendleton Farmers Society. Odessa Sirman Armstrong serves on the College of Agriculture, Forestry and Life Sciences Alumni Board and stays engaged with the Clemson Black Alumni Committee. She is a member of the Emerging Leaders Development Program in Washington, D.C.
An attorney with the Cranford Law Firm, Shaun W. Cranford has served as president of the Columbia Clemson Club, where he led their first Clemson Day at the Statehouse. He also is a leader in the club’s efforts to raise funds for a $25,000 scholarship endowment. President of the MBA Alumni Society, Stephen Epps III is a member of IPTAY, Alumni Council, Greenville Luncheon Planning Committee and Greenville Young Alumni. Active with PULSE, a leadership development program for young professionals, he was recognized as volunteer of the month for July 2013. Tanner James Smith (not pictured) was the first basketball player in Clemson history and only player in the ACC for 2012 to combine +10 points, +5 rebounds, and +4 assists per game for a season. He currently plays in the MHP RIESEN professional basketball team in Germany. He is founder of “Tanner’s Totes,” a nonprofit established to help teens cope with long-term hospital care. Former president of Clemson’s Young Alumni and an active member of the Richmond Clemson Club, Victoria Watson Longshore serves on her church’s hospitality committee and volunteers with the Virginia Special Olympics. William R. Cathcart Jr. received the 2010 Distinguished Leadership Medal for Journalistic Excellence by the U.S. Business Institute. He has worked as managing editor of the Charleston Mercury and as media adviser and speechwriter for the president of the Republic of Georgia, where he also advocates for the region’s cystic fibrosis patients. Pictured (clockwise from left): Cathcart, Miskelly, Epps, Cranford, Berry, Lane, Woodsby, Armstrong, Longshore. During Homecoming weekend, the Alumni Association honored Sonya Ables ’79 (center) as the 2013 Volunteer of the Year, the highest recognition and greatest expression of appreciation extended to an individual by the Alumni Association staff for outstanding service and volunteerism. A member of the Alumni Association board of directors and an IPTAY life member, Ables has served as president of the Women’s Council, where she created the annual Bring Your Daughter to Clemson program, which allows girls ages 6 to 18 to learn about academics, campus life and student activities. She also has been an at-large member of the Clemson Alumni Council and a member of the Alumni National Council. 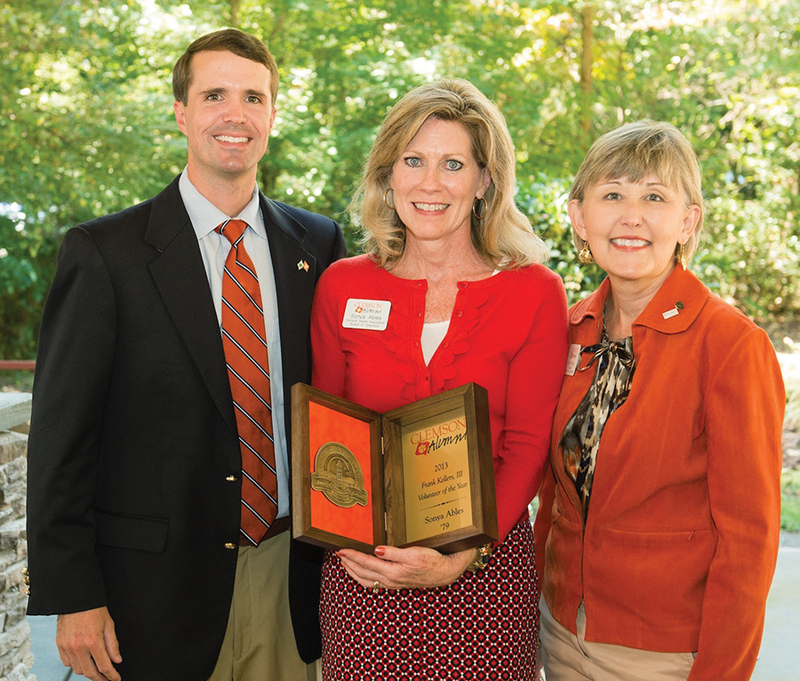 She is pictured with Wil Brasington, senior director of the Alumni Association, and Alumni Association president Ann Hunter. You probably know about the Ring Ceremony, which was begun in 2000 and provides a memorable way for seniors to receive their Clemson rings. Held twice a year, the ceremony includes a lesson on the history, heritage and symbolism of the Clemson class ring from University historian Jerry Reel. You might not know what happens the 24 hours before that event. Preceding the ceremony, the rings are displayed in Memorial Park near the Scroll of Honor. 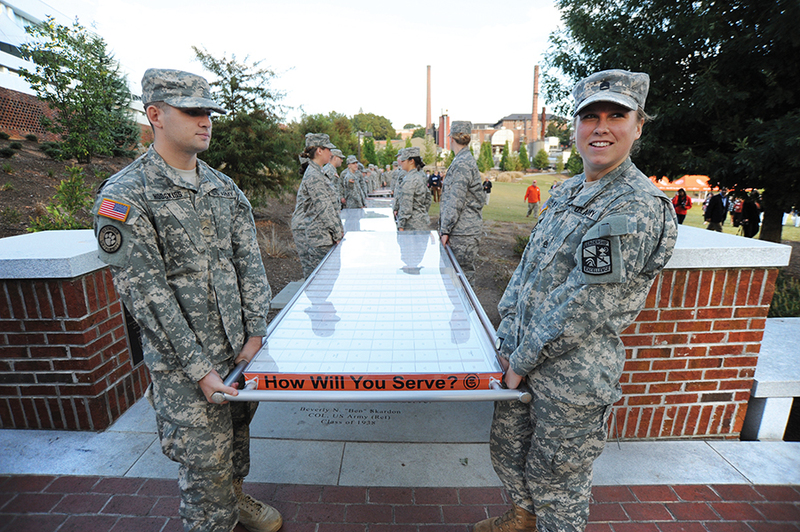 Members of Clemson Corps stand guard over the rings throughout the day (and the night) before the ceremony and then process, carrying the rings to Littlejohn Coliseum for the ceremony. If you’ve lost your ring, never purchased one or you’d like to honor your son or daughter with a ring for their graduation, go online to clemson.edu/ring. There’s also a line of related jewelry available. Tracey Hulsebos ’88 and her husband Tom knew there were Clemson people in Arizona and decided to find a way to bring them together. They utilized social media to find fellow Tigers and hosted several events that brought Clemson fans out of the Southwest woodwork, which led to the creation of the Arizona Clemson Club (AzCC) – one of 73 official Clemson Clubs around the nation. The AzCC, spearheaded by Hulsebos, Sammie Holmes ’07 and Terry Mullane (Clemson parent), brings Tigers across Arizona together to renew their Clemson Family ties, to provide networking opportunities and also to improve the quality of life for surrounding communities. The AzCC plans a variety of events throughout the year. Last summer, the club met for a send-off party for new students Jackie Dunham and Dylan Kennard. Dunham’s parents expressed tremendous comfort and excitement in joining the Clemson Family, knowing their daughter was going to be on the other side of the country. The AzCC has several events planned for the upcoming year including food drives and a Military Appreciation Day celebration. No matter what the AzCC does, be assured it will reflect “One Clemson” and provide a comforting reminder that even the desert bleeds orange. There are clubs across the country to provide you with ties to the Clemson Family. Go to clemson.edu/alumni to find a club near you. Clemson Alumni Association is your ticket to the world’s cultures, sights and sounds. We handle the arrangements and work with high-quality providers so that you can relax, explore and immerse yourself in dream destinations. We offer special trips providing unequaled access, educational value and Clemson experts to enrich your experience. 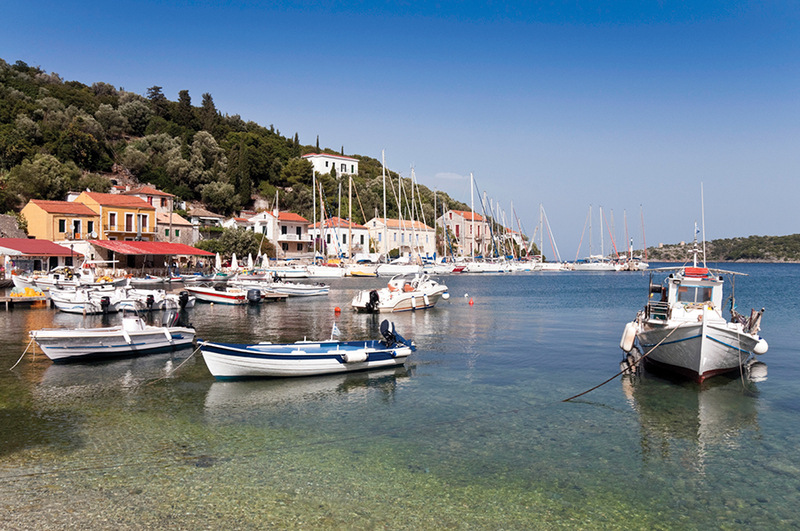 Upcoming trips include Normandy, the Greek Isles, Oxford, Europe and Alaska. Contact Randy Boatwright at brandol@clemson.edu. If you live in the Orlando area, you’ve probably noticed the amazing job that the Orlando Clemson Club does with their email blasts. The club president, Matt Alexander ’09, works hard to capture and engage local alumni by pulling in photos of their events in every email blast. Members of the New York/Tri-State and New England Clemson clubs gathered with representatives of IPTAY, the Alumni Association and Clemson Fund on Friday, Oct. 4, at the Blue Tusk in Syracuse, New York to celebrate Clemson in Syracuse. If you were watching ESPN this fall, you may have seen the Clemson alumni flag crop up at some odd locations. 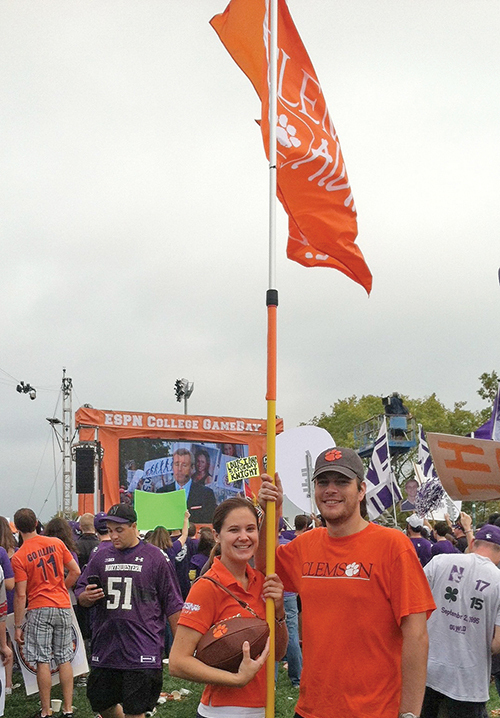 The Alumni Association reached out to alumni in areas that hosted ESPN College GameDay and provided them with a Clemson Alumni flag to wave during the show. Pictured here are David Pawlowski ‘01 and Tara Young at the Northwestern game. The Alumni Association has named entomologist Alfred G. Wheeler Jr. an honorary Clemson alumnus. 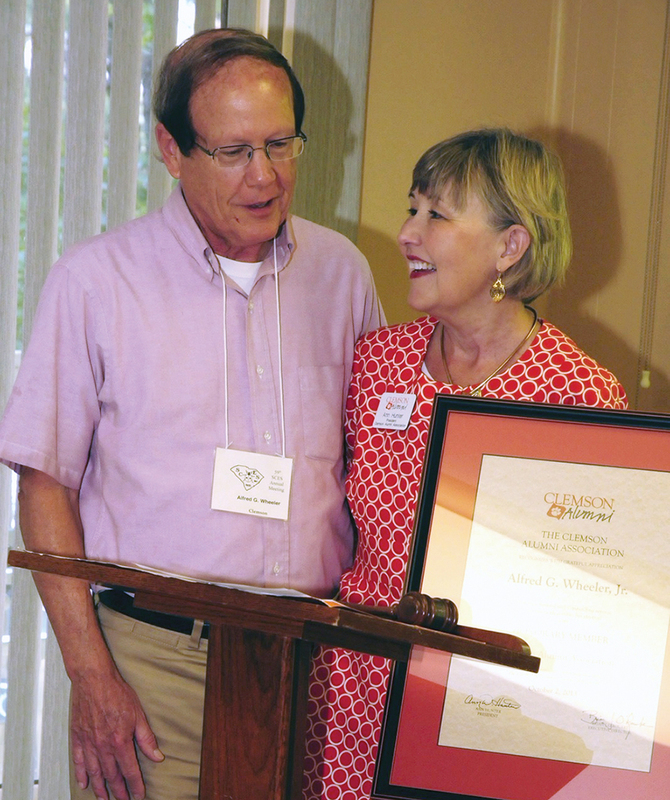 Wheeler, pictured here with Alumni Association President Ann Hunter, retired to Clemson as an adjunct member of the entomology program after 25 years with the Pennsylvania Department of Agriculture. In his 17 years at Clemson, he published more than 115 research papers, served on 16 graduate student advisory committees, mentored several Creative Inquiry undergraduate research projects, volunteered to coordinate the entomology seminar series for six years and worked as editor of South Carolina Biota for more than a decade. Wheeler also established a $100,000 endowment to support research expeditions for entomology graduate students.